A Kenmore microwave makes our lives simple. Most of us take our microwaves we have in our Dallas-Fort Worth home for granted because they are so reliable. It’s second nature expecting your food to be heated up instantly. But when your Kenmore microwave isn’t working properly, however, it’s better to call a Kenmore microwave repair professional sooner rather than later so you can get back to the convenience of instant food preparation—who wants to go without a microwave for any amount of time? Also, fixing your microwave yourself is dangerous. When you’re dealing with electrical components, you need to know exactly what you’re doing. Microwaves are small, but they pack a big punch with all the energy they store. You have to be extremely careful when replacing parts so you don’t connect something the wrong way and cause a potentially dangerous situation. 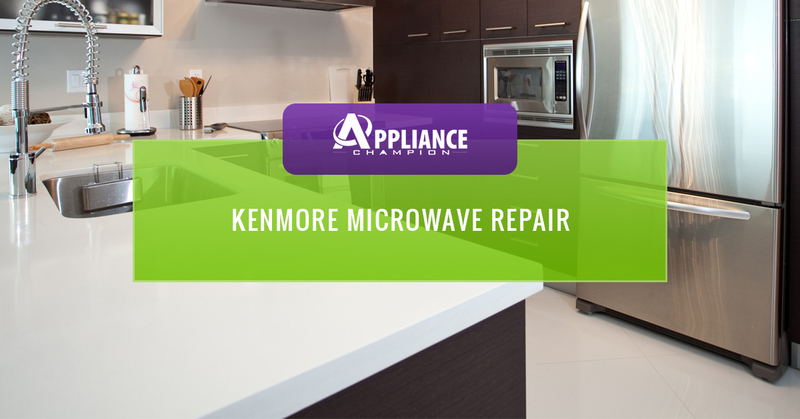 Don’t put you or your family at risk of electrical shock—hire a local Kenmore microwave repair professional instead. Kenmore microwave repair is something that shouldn’t be taken lightly. A seemingly easy fix could be costly or deadly in a matter of seconds. Play it safe and call an Appliance Champion repair professional to get your microwave back to the time-saving appliance it was meant to be. We understand that if you take our advice to not DIY your microwave repair, that you could choose anyone to help you address the problem. However, there is a reason why we qualify as a Top Rated Local® appliance repair company. We always provide same-day service and usually have the proper Kenmore part that you need to complete the repairs that you need. Additionally, if you need emergency repair, no need to worry; we always have someone on call. We can’t speak for our competitors, but when an Appliance Champion microwave repair tech walks through you door, you can rest assured that they know exactly what they are doing being factory-certified, drug and background tested. Our appliance repair techs always have the proper tools and the Kenmore parts needed, due to our close relationship with brand-name manufactures. Clients we serve include those in the Keller, Southlake, Grapevine, Colleyville, Bedford, North Richland Hills, Arlington, and Saginaw area and beyond. Call Appliance Champion for unbeatable service!